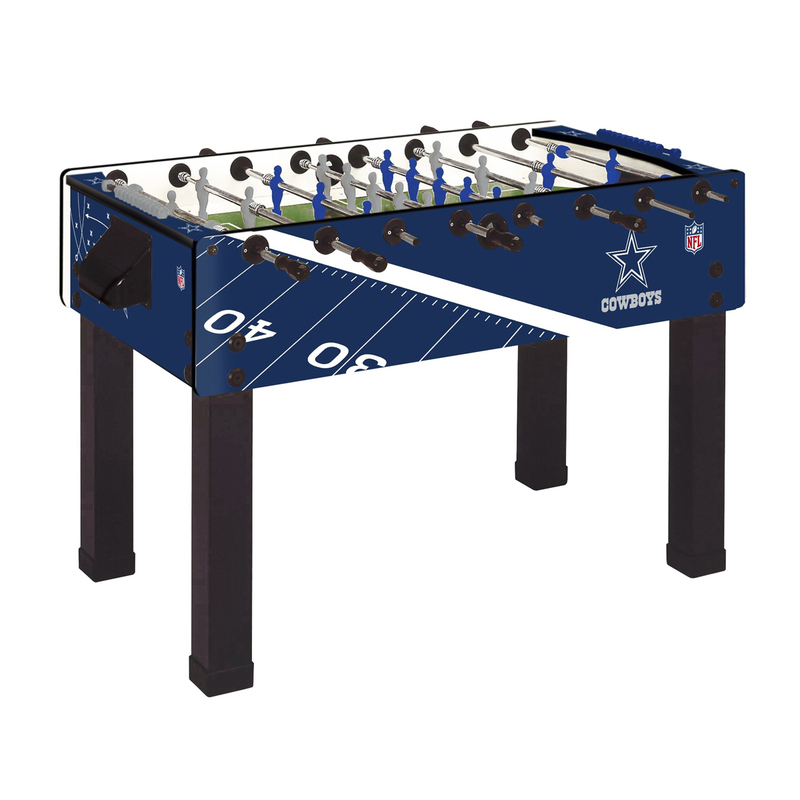 Get in the game with your favorite NFL Licensed Team Foosball Table made by Garlando! The 3/4-inch thick MDF cabinet has your team color graphics with a melamine coating protecting against scratches and dings. Heavy duty 3-1/2" square metal legs are coated with anti-scratch black melamine provide stability and great looks. The play field is a plastic laminate with green background and white lines to look like a futbol pitch. Telescopic rods are made of 5/8-inch high stress resistant steel and coated with anti-rust chromium-plating. Steel ball bearings greatly improve the game speed while reducing stress on the player's wrists. Players are made of unbreakable plastic and are molded onto the rods. Ball returns are placed conveniently behind each goal to provide quick and easy ball recovery. Cube scorers on each end. Includes 10 white standard balls. Dimensions: Cabinet: 57"Lx29"Wx35"H; play field 47-1/4"x28". Made in Italy. Ships LTL.